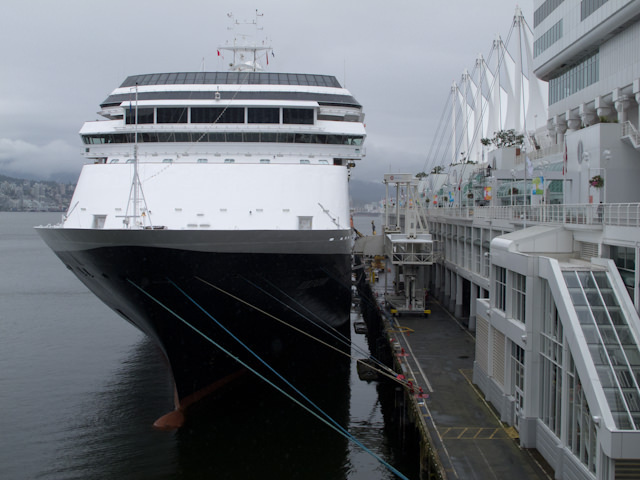 When we toured Holland America Line’s 781-foot long, 1,432-guest Volendam in the port of Vancouver, it was a grey, cold and uninspiring day in the month that was quickly becoming famous locally as “Juneuary” for its unseasonable weather. 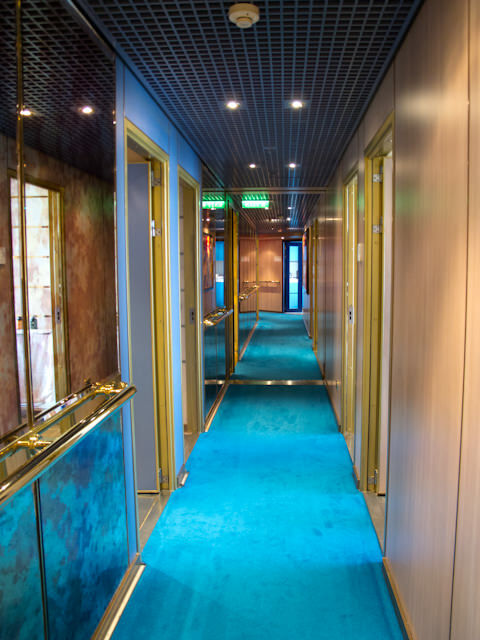 But stepping across the tide-sensing gangway and into the warmth of the Volendam, we discovered a bright and vibrant world carefully nestled within this popular Holland America ship. 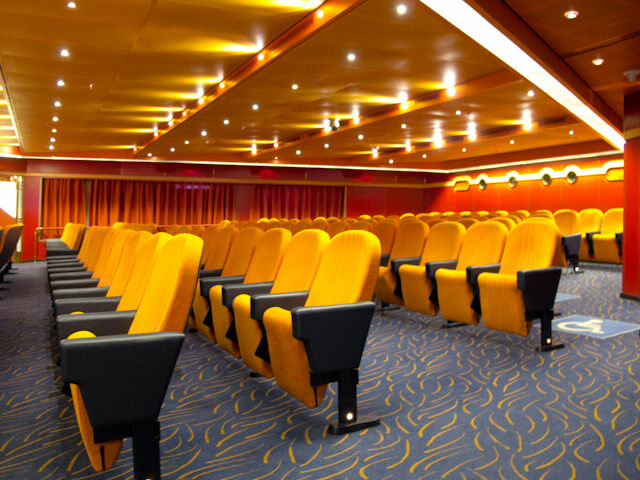 A direct sister-ship to the 2000-built Zaandam and a near-sister to the Amsterdam and Rotterdam, Volendam will pose no issues for guests who are familiar with Holland America’s midsized fleet of comfortable, navy blue-hulled “dam” ships. Without further ado, let’s start from the top and work our way down this magnificent, 1999-built cruise ship and discover why she’s a constant favorite on the Alaskan summer runs. 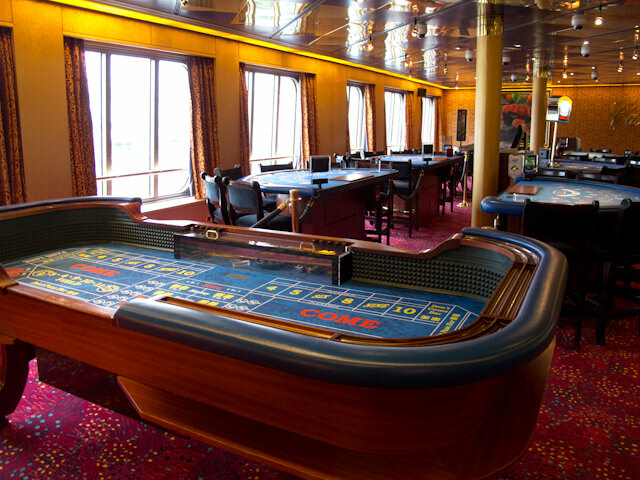 The highest deck of public rooms aboard Volendam, the Sports Deck also hosts a wide expanse of open deck space running parallel to the electric Magrodome that can be open or closed above the Lido Pool one deck below. Tennis and volleyball courts are also found here, along with the line’s Club HAL facilities for kids and teenagers. 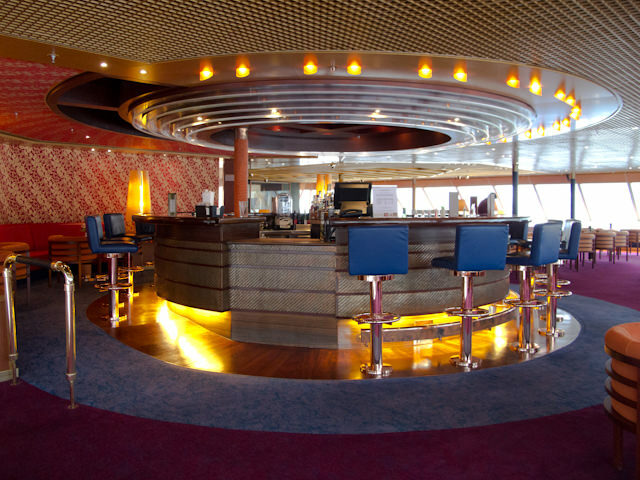 A Holland America Line staple, the Crow’s Nest is always a popular place to relax by day, and party by night. 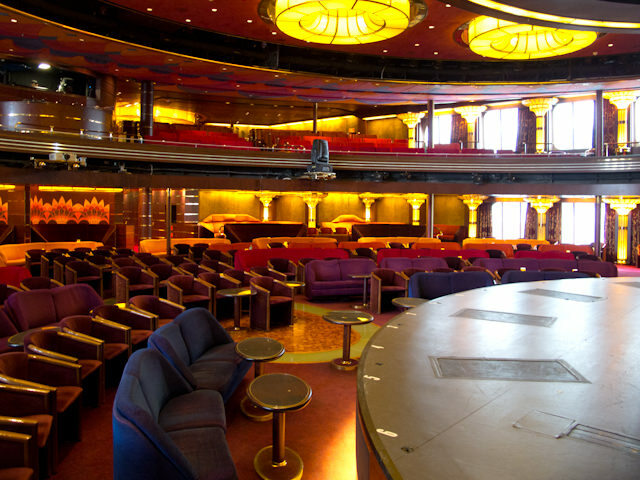 Enormous, 180-degree wraparound windows flank every corner of this room, which contains a circular bar just off of the centerline toward port, a dance floor, oversized video screen, and several sections of intimately designed seating. By day, you’re likely to find people up here enjoying a good read in the “Captain’s Chairs” that overlook the bow, but by night, the Crow’s Nest is a hip, happening place filled with great music, dancing and drinks. 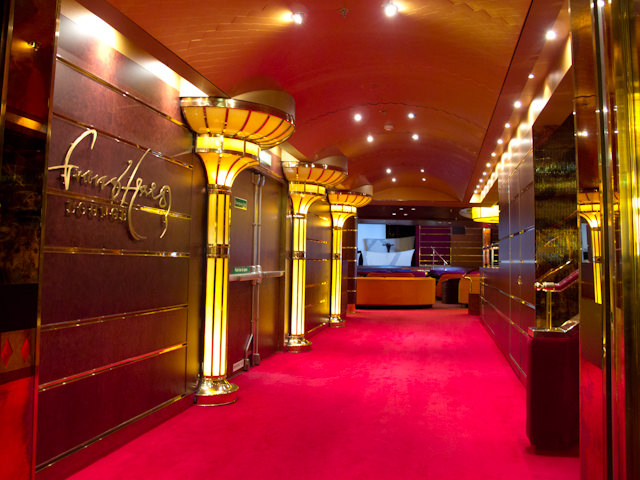 The unofficial center of the ship, the Lido Deck is home to the extensive Greenhouse Spa facilities, gymnasium, the Lido Pool, and the Lido Restaurant, which also incorporates the Italian-themed Canaletto Restaurant in the evenings. An aft-facing pool and plenty of open deck space for lounging rounds out the mix. 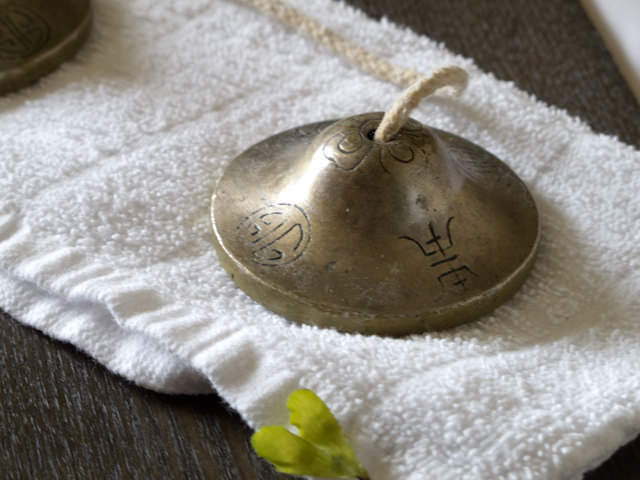 Looking to unwind? 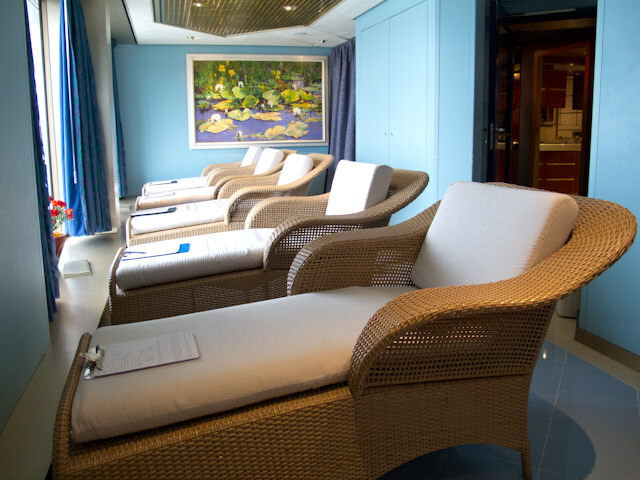 Look no further: The Greenhouse Spa aboard Holland America’s Volendam is nearly as extensive as those found aboard her larger Vista-class cousins. 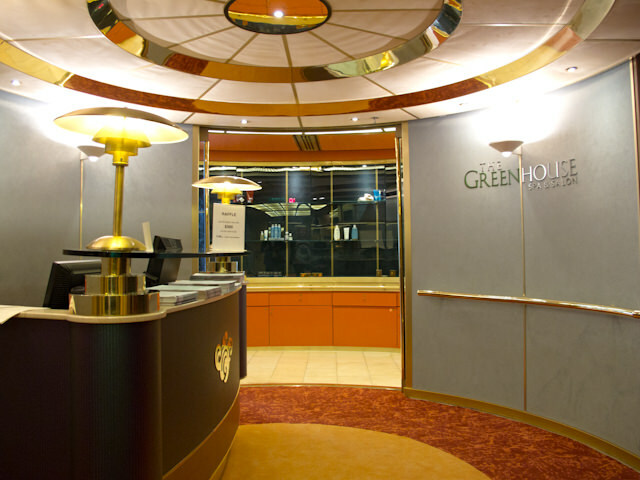 With an attractive reception and waiting area just off the port side of Volendam’s forward staircase, the Greenhouse Spa features a thermal suite that features several ceramic heated loungers, and a small hydrotherapy pool that’s similarly sized to a hot tub (sorry to all those who are fans of the magnificent hydrotherapy pools found on Zuiderdam and her sisters). 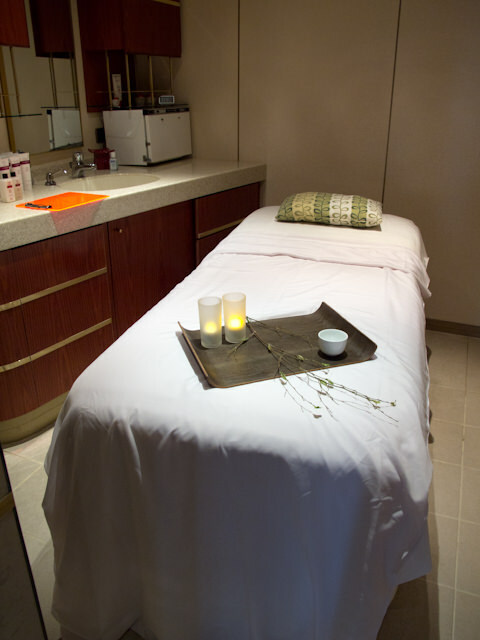 There are also plenty of massage and treatment rooms located along the starboard side of the ship, each one with its own special theme and feature, from hot stone massages to deep tissue to aromatherapy treatments. 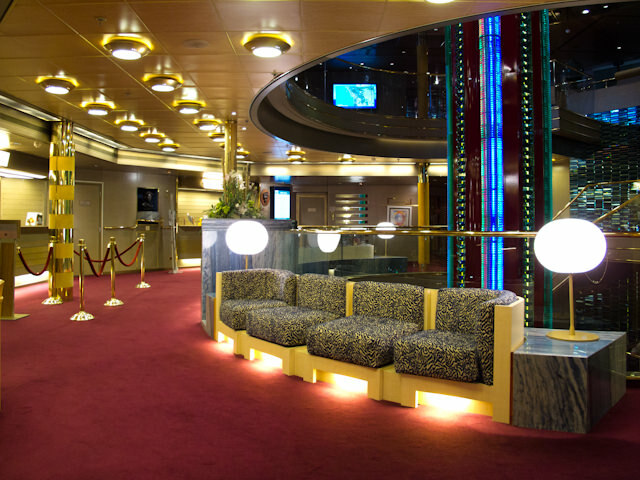 A beauty salon is located just off the reception area and includes all the treatments you might expect, and a fully-equipped gymnasium is just forward of the reception area, on the port side. 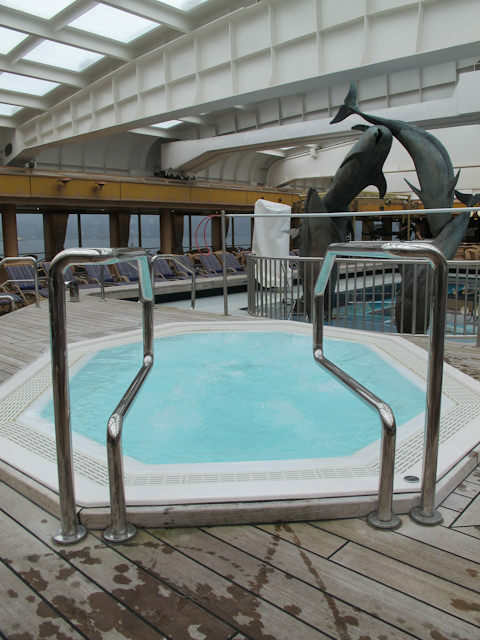 Just aft of the Greenhouse Spa is another Holland America Line staple, the combination indoor/outdoor Lido Pool. Thanks to an electronically-controlled Magrodome that can open or close depending on the weather, the Lido Pool functions as an amazing outdoor pool deck, bar and eating area in good weather, and a cozy place to relax and enjoy the heated pools and hot tubs when the weather is inclement. 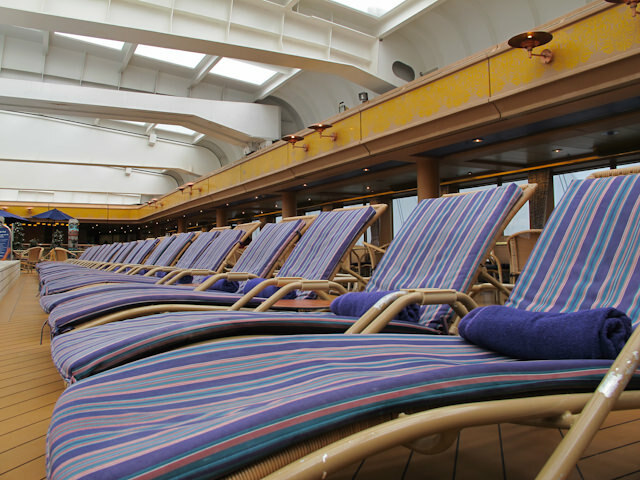 The best part about these Lido Pool decks is that, like every other aspect of Holland America’s vessels, their décor is entirely unique to that ship, transforming an otherwise uninspiring space into a continued journey of discovery, regardless of how many times you’ve sailed with the line. 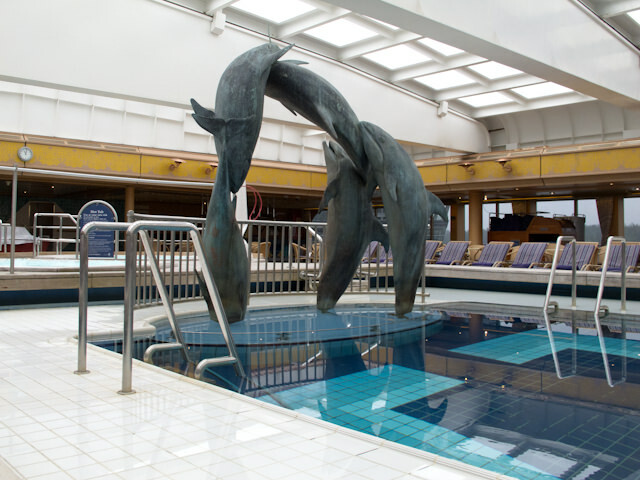 Just like other ships in the Holland America fleet, Volendam boasts her own unique poolside sculpture. Named after the beach near Venice, Italy, The Lido Restaurant is Volendam’s casual dining venue. 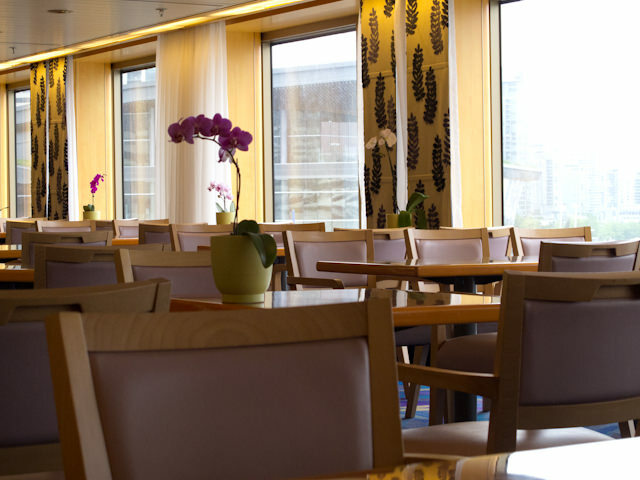 Flanked by bays of floor-to-ceiling windows, the Lido Restaurant serves up breakfast, lunch and dinner. But that’s the overly simplistic answer; the truth of the matter is that the Lido features an astonishing variety of different food types, including healthy alternatives, Asian cuisines, hot meals and cold snacks. They also make a mean Jell-O cup. Our personal favorite: Be sure to hit up the pasta station at lunch; they make some great meals to-order, and don’t pass up the sushi and sashimi – it makes a great, and somewhat healthy lunch. In the evenings, a section of The Lido on the port side becomes the reservations-only Canaletto Restaurant and can be distinguished by its attractive dark-wood furniture. 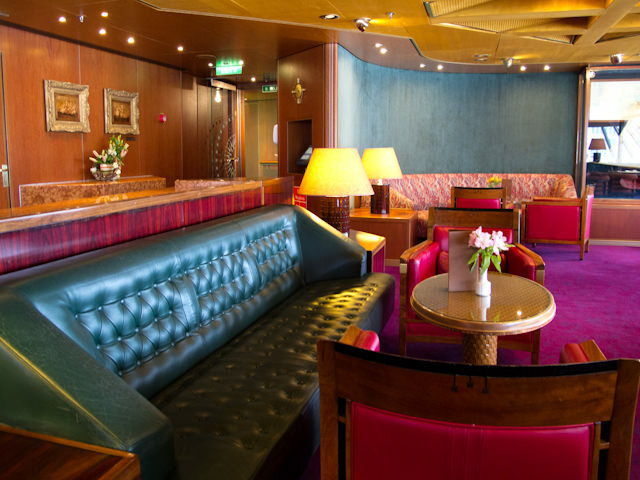 Tucked away on Navigation Deck, near the Midships staircase, is a room that’s guaranteed to be a hit with anyone booking one of Volendam’s Category SA, SB or Penthouse Suites: the Neptune Lounge. 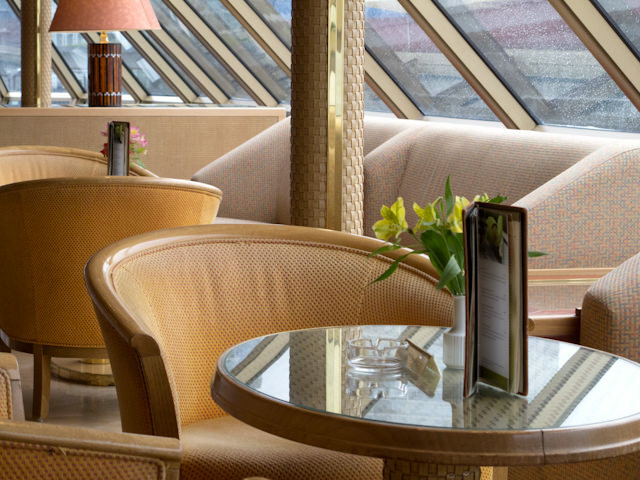 Designed exclusively for guests in these premium suites, the Neptune Lounge is filled with canapés, fresh coffee and juices, pastries, and other tasty indulgences. 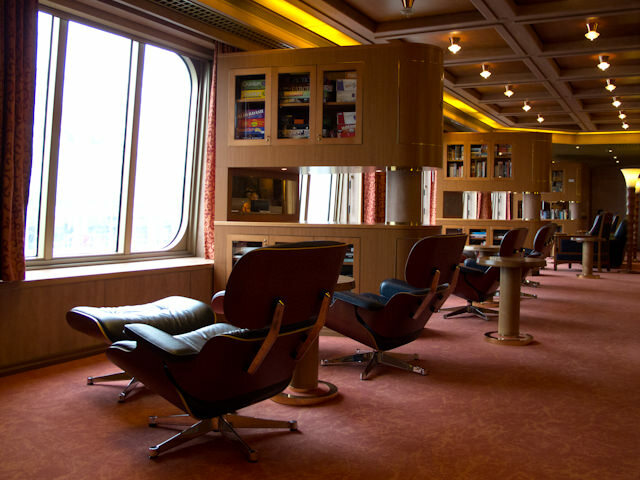 There’s a full selection of magazines and books devoted to all things maritime, and some plush loungers that are perfect for sinking into and whiling away a few hours. 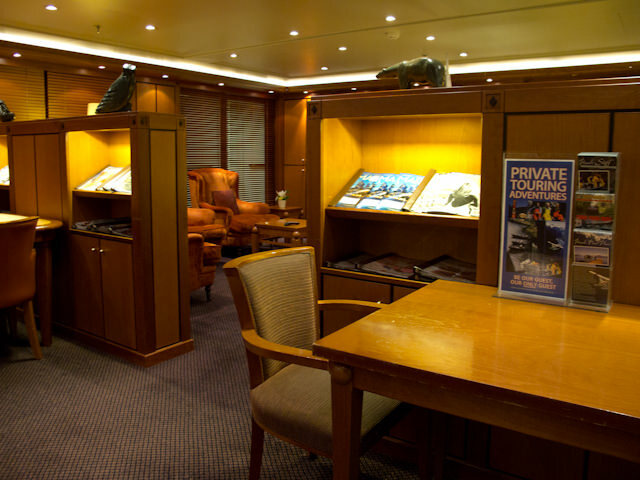 I experienced the Neptune Lounge once, about six years ago on a short repositioning voyage where I was lucky enough to have secured an S-Suite for myself. 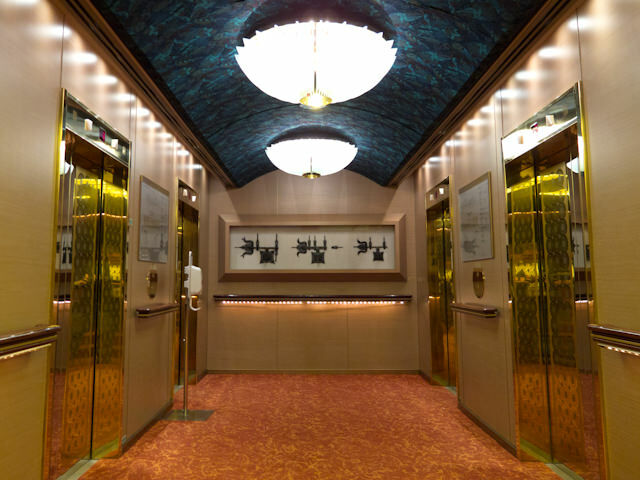 Let me say this: The Neptune Lounge is a worthy companion to these spacious suites. 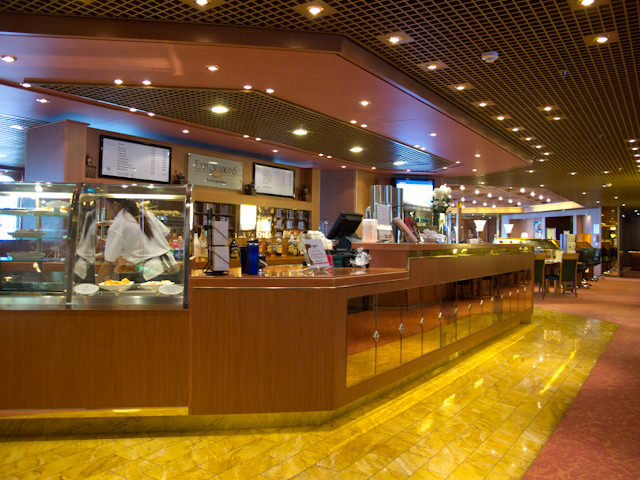 Located all the way forward and spanning both the Upper Promenade Deck and the Promenade Deck below, the Fans Hals Lounge is Volendam’s key nighttime entertainment venue, housing full-scale Broadway-style production shows, hilarious comedians, and a variety of other entertainment options throughout the day. 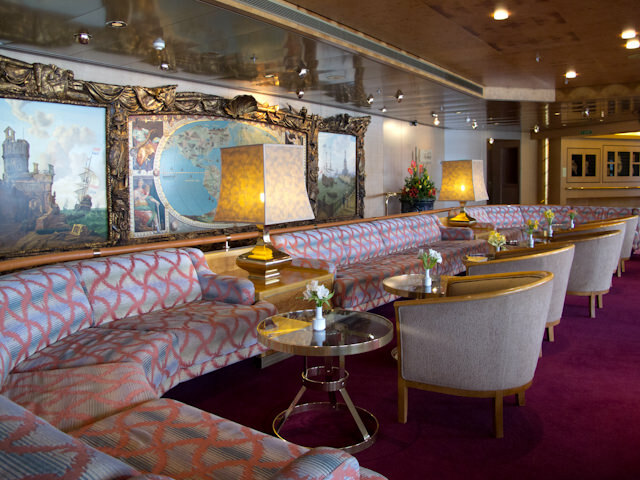 Like all other Holland America ships, the design of the Frans Hals Lounge is unique to Volendam. Bright colors intermingle with classy Art Deco design elements to create a room that is stunningly beautiful by day and soothing yet funky by night. A variety of intimate seating options are available, from clubby booths to theatre-style bench seating to intimate tables featuring backlit glass “cups” with flowers inside. It’s so attractive, you’ll wish this room was used more during the daytime. 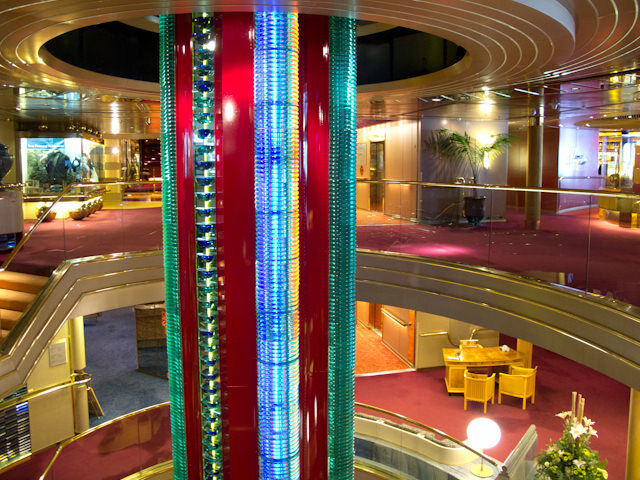 Moving aft along the Upper Promenade Deck, we pass the forward elevator and staircase banks before coming to the Atrium, with its stunning – and decidedly different – fluorescent column that spans three decks in height. Our take? It’s always looked odd in pictures, but in person, it works remarkably well. 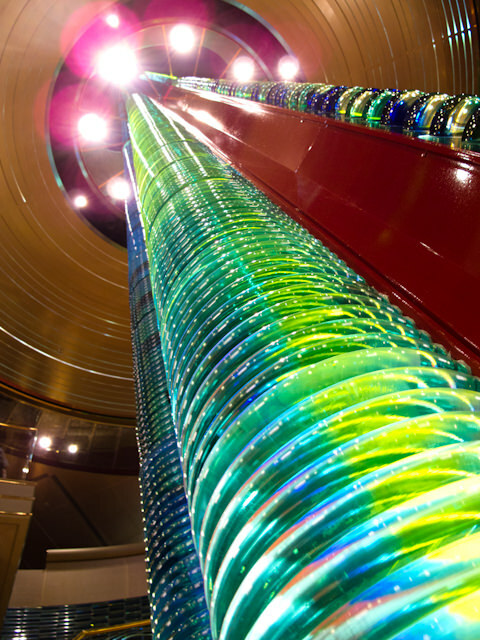 The Volendam feels vibrant and high-tech throughout, and this atrium sculpture only seems to personify that. Best of all, one of Holland America’s most popular watering holes – the Ocean Bar – is located just off to the starboard side. Moving aft yet again, we come to Volendam’s Casino. 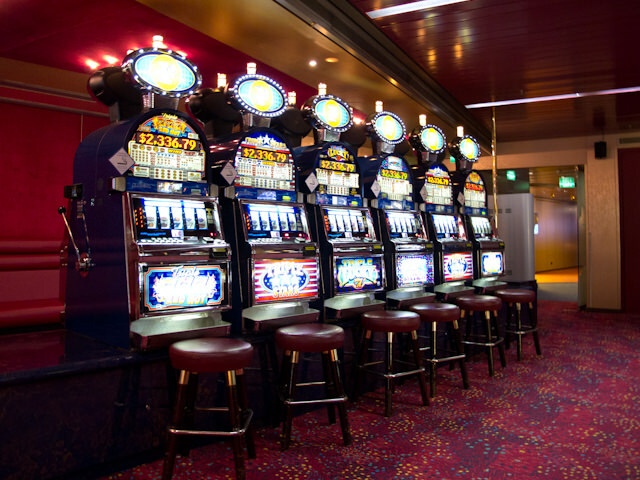 Modest in scale compared to some of the newest megaships, the Casino aboard the Volendam has enough bells and whistles to please those who listen to the siren song of Lady Luck, but remains small enough so as to not be a bother to those who would rather bypass temptation altogether. 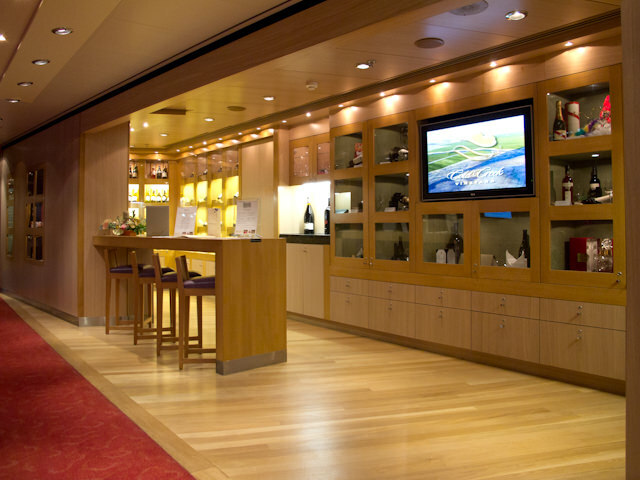 A Sports Bar and the ship’s shopping boutiques are off to the starboard side, but we have never liked the original configuration of the sports bar on these ships. It seems dark and very out-in-the-open, but Volendam does sport a more aesthetically-pleasing one than those found on other ships. Still, it’s a minor quibble given how many other fantastic public rooms are available; everyone can have his or her favorite. 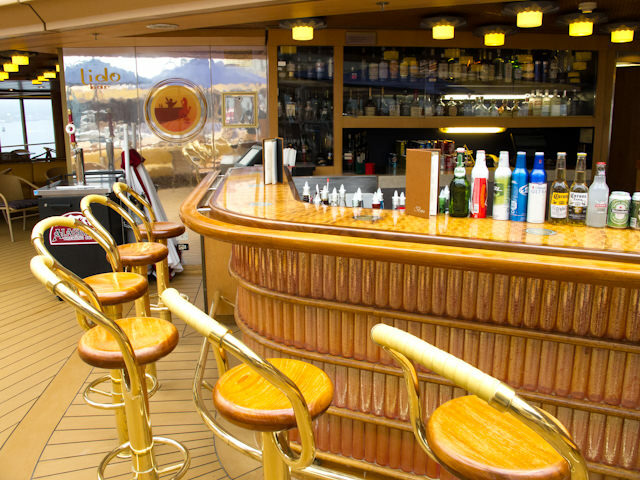 Our favorite bar onboard the Volendam is just a few steps away: the Piano Bar, located along the starboard side of the ship flanked with enormous windows that let in the awesome vistas of Alaska. 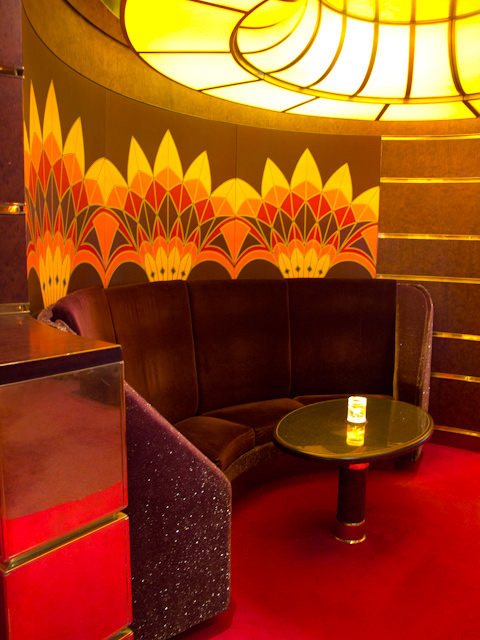 Done in bright pinks, purples, blues and yellows, the Piano Bar offers cozy seating in booths tucked away off to the side, or more front-and-centre seating options that look out over the piano itself and the corridor nearby, a great attraction for drawing a post-dinner crowd. 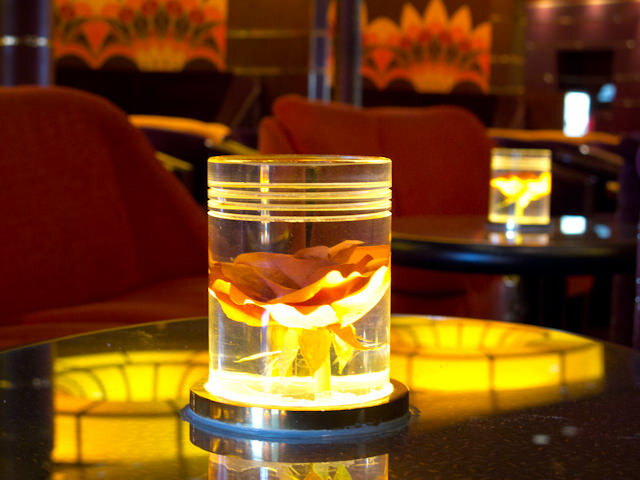 Stools are also available at the bar itself, and the wide variety of seating choices for such an intimate venue makes this one of our favorite spots on any ship, hands down. 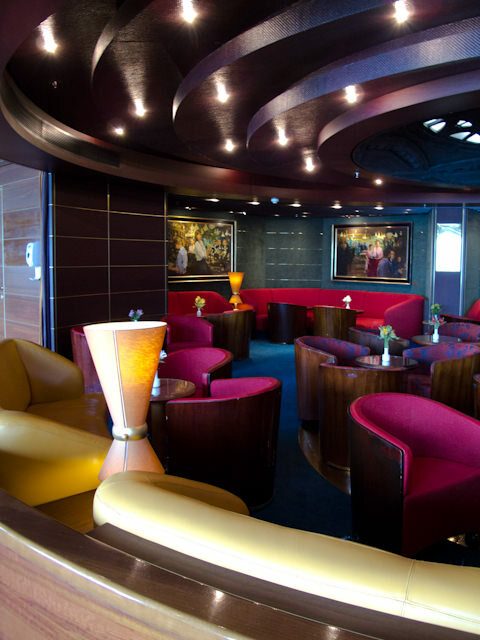 Another passenger favorite, the Explorer’s Lounge is conveniently situated between the midship and aft staircases on the starboard side of the ship, and is a huge hit with the pre-and-post-dinner crowd given its proximity to the Rotterdam Dining Room located just a few more steps aft. 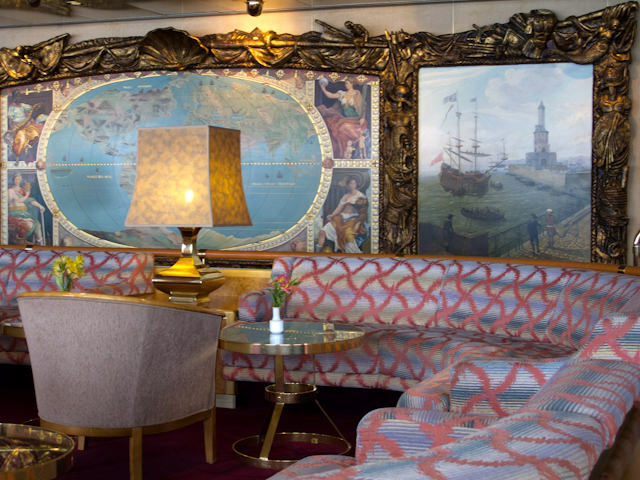 Unique to each ship is the enormous mural mounted on the inboard bulkhead, with Volendam’s evoking a Baroque style and theme. 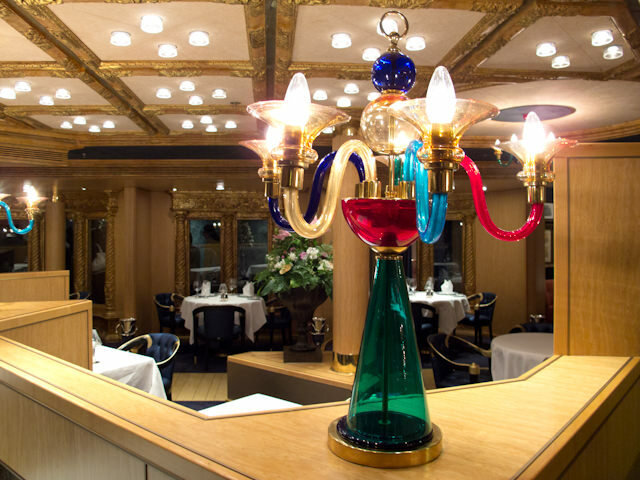 Due to lunch set-up, we were unable to take photographs of the Rotterdam dining room, which spans two decks in height and features wraparound, aft-facing windows. 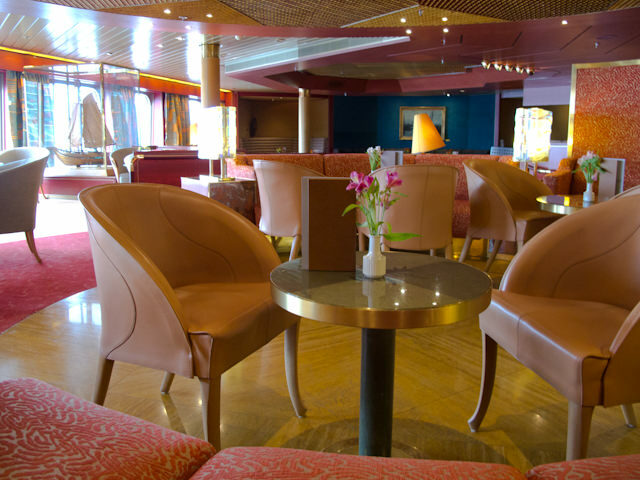 Moving over to the port side of the Upper Promenade Deck, we come upon the Exploration’s Café, one of the most popular innovations Holland America implemented as part of its Signature of Excellence enhancements several years ago. 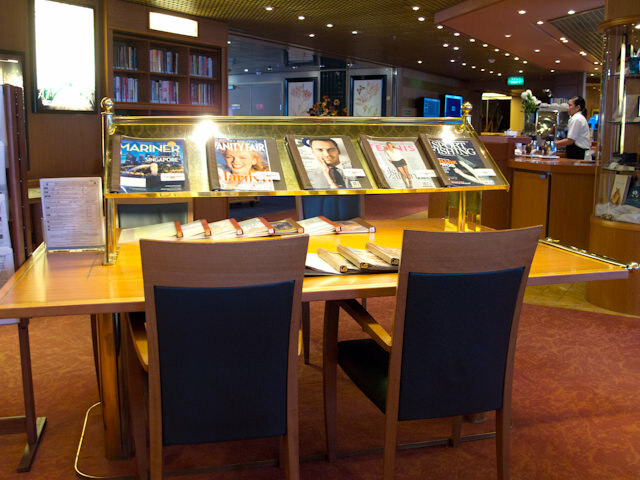 What was once a small library, card room and internet center has been expanded into a comfortable, relaxing public room where guests can order up coffee, tea and a variety of drinks along with pastries and treats like cookies and canapés. Comfortable loungers are also available, along with plenty of games, crossword puzzles, jigsaw puzzles, and other entertaining diversions. 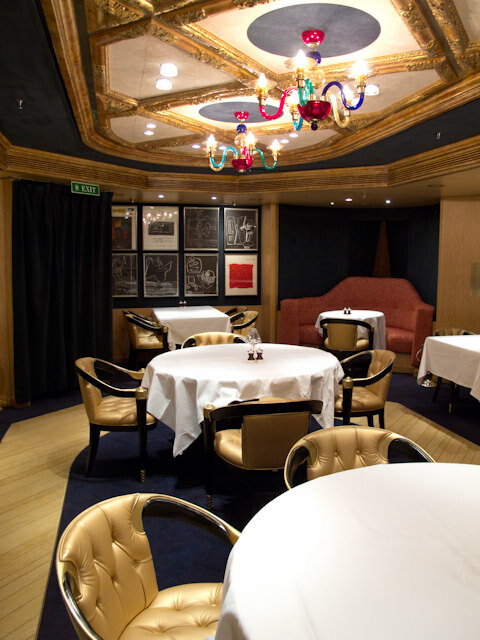 Moving down one deck using the midship staircase, we come to the elegantly-designed Pinnacle Grill, Holland America’s premium, fee-based specialty restaurant. 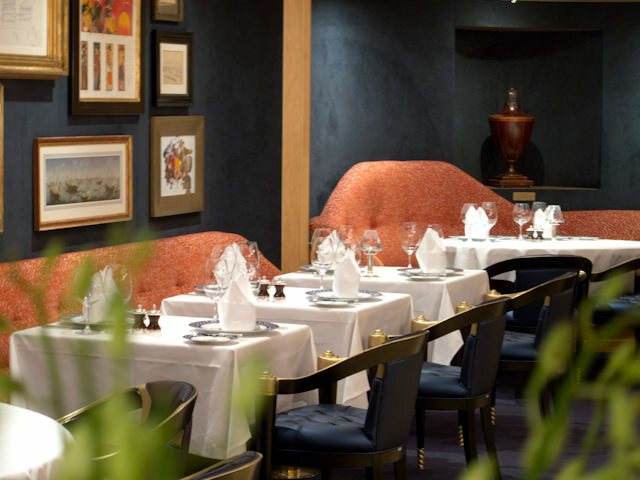 It may be one of the only public rooms onboard that lacks exterior windows owing to its location next to Volendam’s lifeboats, but the Pinnacle Grill still features several bay-style windows that look out into the interior corridor. But windows are secondary to the fantastic meals you’ll enjoy in this intimate and beautifully designed room. 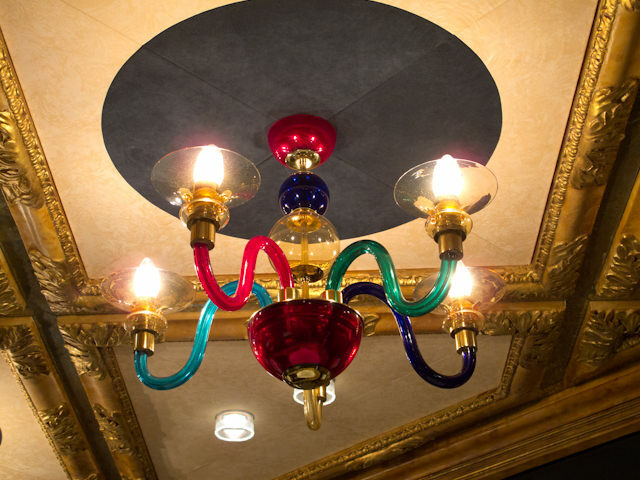 Our favorite feature: the striking, multicolored candelabras that adorn the Pinnacle Grill. 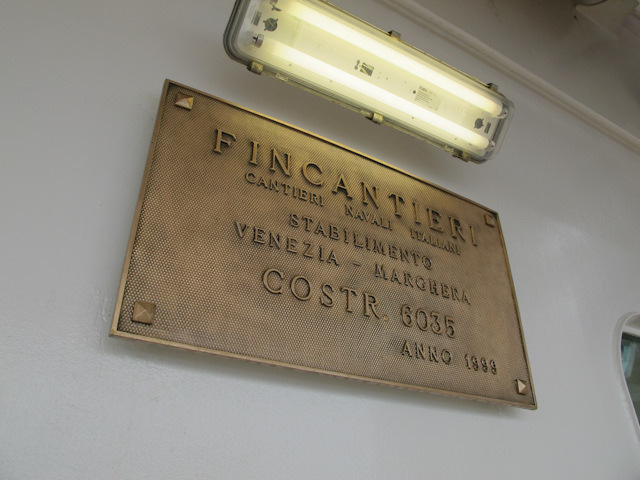 When she was launched, this space used to function exclusively as the ship’s onboard theatre – a rare feature in and of itself. 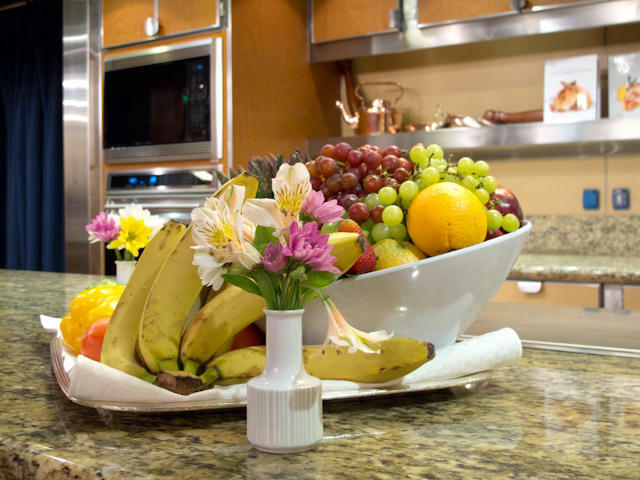 Today, though, this space enjoys enhanced popularity as the location of Volendam’s Culinary Arts Center. 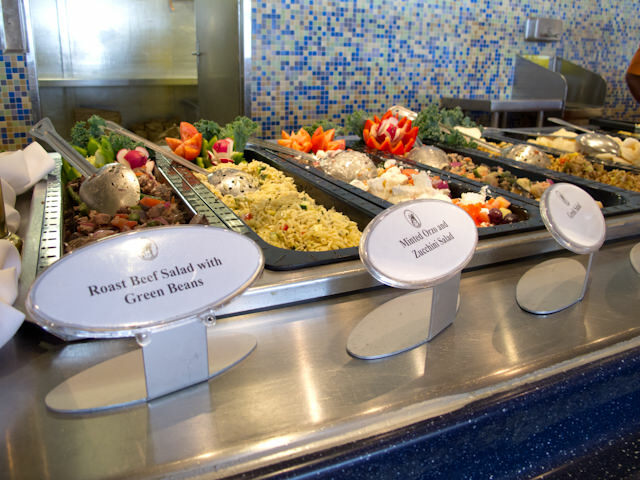 Cooking demonstrations are held here throughout the cruise, and guests naturally have the chance to actively learn how some of their favorite meals onboard and off are prepared. Embarking guests were treated to some delicious cookies and canapés, along with a great overview of some of the classes and demonstrations scheduled for the rest of the day, and the voyage. Tucked away just aft of the Atrium, it’s easy to miss the Wine Tasting Bar as you walk past, but don’t. Instead, linger here over a glass of a full-bodied Malbec or perhaps the seductive sweetness of a German Riesling. 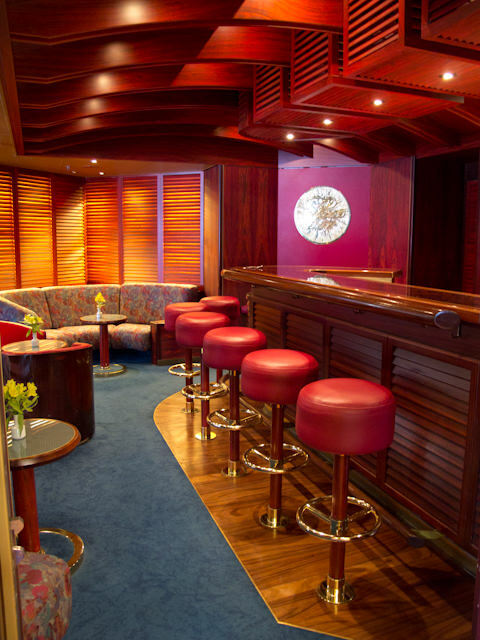 It’s a cozy, little bar located in an out-of-the-way part of the ship, and it’s not difficult to imagine that it’s all created just for you. 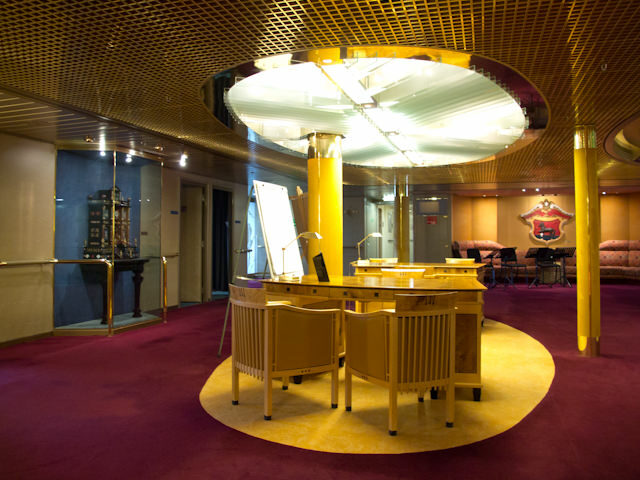 Returning to the fluorescent Atrium sculpture, this level of the Atrium houses Volendam’s Reception area and Shore Excursion desks. 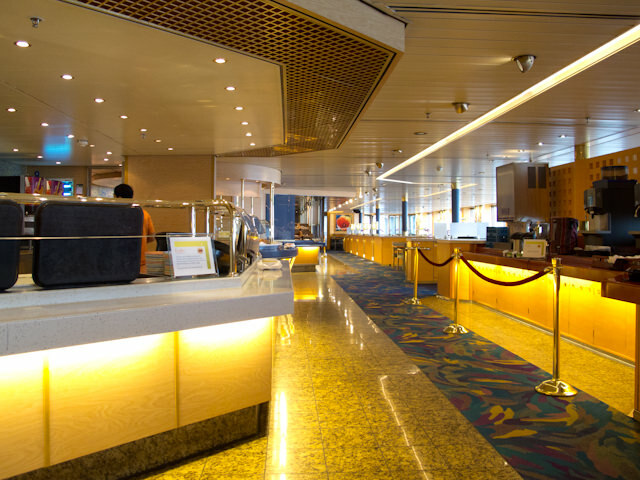 Here, questions pertaining to your onboard account or your days ashore can be taken care of by Holland America’s friendly staff. It took just a few short hours aboard the Volendam to convince us that this ship, like so many other Holland America vessels, is perfectly suited to Alaska. Inside, she’s cozy, intimate and comfortable and designed not just for perfect Caribbean weather, but for anything Mother Nature can throw at her. 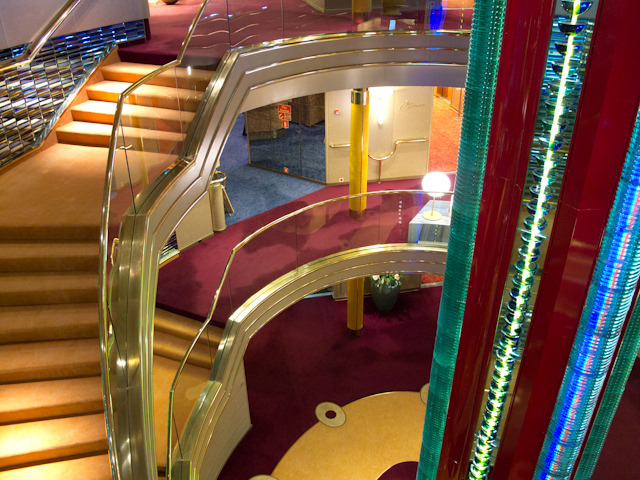 She’s also one of the most brightly-designed, vibrant and energetic-feeling ships we’ve been on. The best thing about her, though, is that feeling of returning home. 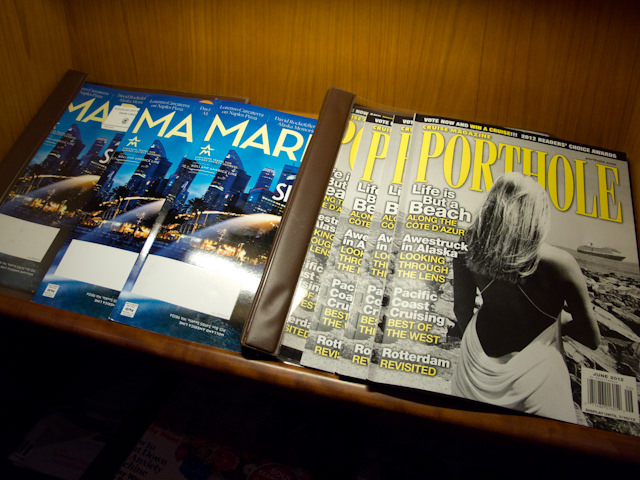 Past Holland America guests, known as Mariners, know it well. There’s the friendly Indonesian and Filipino crew, waiting to greet you as you board. A common deck layout makes the ships easy to navigate, but distinctive artwork, color palettes and design features give each ship a bold personality that is entirely unique. 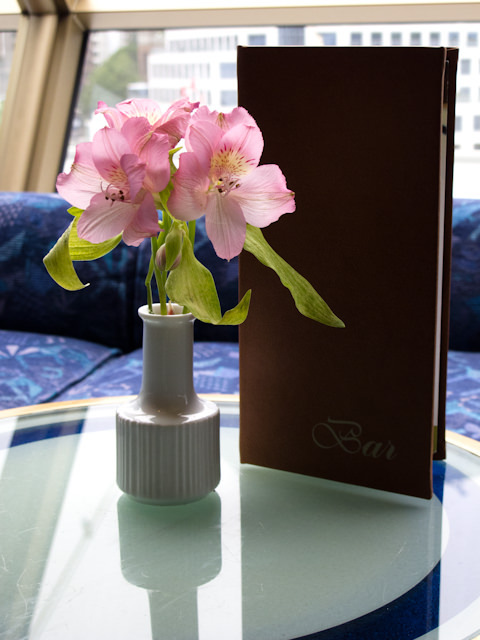 A “dam” ship has a certain understated elegance to it, and it’s a feature that keeps passengers coming back again year after year.